Single digit temperatures have returned to the weather forecasts for Toronto, and people are starting to suit up in scarves. I even saw people wearing gloves. Winter is coming. Eventually. It’s not here yet, but I might as well get ready for it! I’ve been accumulating quite a collection of winter tips and experiences. Last winter worked out pretty well. What will I try this year? Proper sewing: I’m going to get the hang of this eventually! It’s a good skill to have. I can work on finally finishing those box cushion covers. Hacklab, maybe twice or thrice a week? New drawing workflow: index cards, sketchbook? I think it’s time to get a new coat and a pair of winter boots. Oh well! I didn’t find anything I liked in last year’s end-of-season sales, so I guess I should probably reconcile myself to paying full price or close to it. 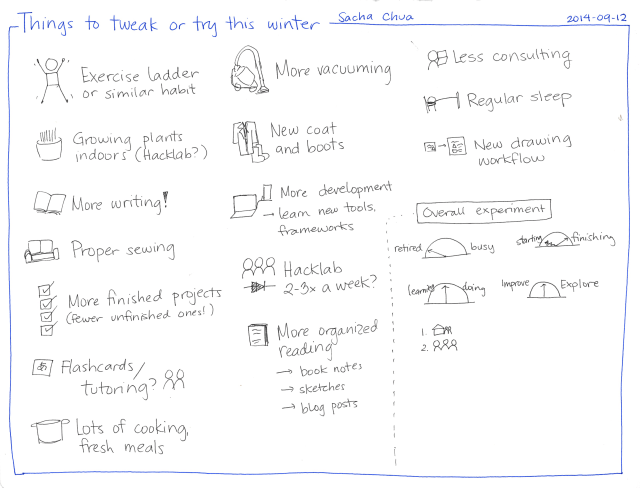 I liked last year’s idea of thinking in terms of longer nights, since I do tend to divide my activities into day (work, writing) and night (relaxing, drawing). Maybe I’ll play with that some more. Hey, maybe the Canadian citizenship grant includes cold tolerance. Always wondered why W- and J- think ice cream season is all year long!